Feit Consulting is pleased to announce Monice M. Kaczorowski is joining our team as the new Vice President of Library Strategy and Innovation. Throughout her extensive career as a law librarian, Monice has built a strong foundation as a thought leader, building, renovating, and restructuring firm libraries across the country. She is a long-time advocate of law libraries and their essential and evolving role in the law firm setting. Monice is a published professional and well-known speaker, often highlighting the role library services play in supporting the business of law. As a Competitive Intelligence professional, Monice has developed CI strategies that allow law firms to grow their bottom line and identify new business opportunities. As a former Chief Knowledge Officer, Monice has been a proponent of law firm KM as a way to improve attorney workflow and foster efficiencies within the practice of law. As an early adopter of the sole-provider concept, Monice believes evaluating the sole-provider option provides law firms the valuable opportunity to evaluate their current legal information resource strategies and assess their current costs associated with those services. As the Vice President of Library Strategy and Innovation, Monice will lead Feit Consulting client engagements that are focused on implementing library modernization, working directly with clients in conducting library audits and leading the Sole Provider Viability Process. In addition, she will spearhead the development of Feit Consulting’s future white paper on library modernization and will oversee Feit Consulting’s expert panel. As part of the leadership team, Monice will provide strategic input toward growing Feit Consulting's position as a leader in the management of legal information. Monice holds a Master's degree in Library Science from the Graduate School of Library and Information Science at Dominican University (Rosary College). Her professional affiliations include memberships in the Special Libraries Association (SLA) and American Association of Law Libraries (AALL). She is a past member of the WEST Advisory Board (2002-2004, 2008-2010). In addition, Monice was the AALL Liaison to the Association of Legal Administrators 2010-2013. She served as the co-chair for AALL Publishing Initiatives Caucus (PIC) (2010-2014), as well as serving as a member of the LexisNexis Librarian Advisory Board (2011-2015). The addition of Monice Kaczorowski as the Vice President of Library Strategy and Innovation strengthens Feit Consulting’s mission to provide more than cost solutions--to empower leadership in legal information management. The Westlaw/Lexis duopoly has broken down. Most firms no longer accept the notion that there is a need to have both vendors. Vendor elimination may come with some initial hassles and inefficiencies. When properly managed and successfully executed, the hassles associated with vendor elimination quickly fade, and an abundance of new efficiencies are created. This is a rare opportunity for firms to free up considerable resources, allowing for the purchase of new and exciting complementary products. When Feit Consulting first started writing The Sole Provider Playbook, our view was that for a majority of large law firms, the sole-provider option would not be truly viable. After diving into the factors contributing to the sole-provider trend, we have changed our minds. With most firms recovering less than 50% of their legal information costs, it no longer makes sense to have both vendors. When you consider the redundancy, coupled with the mounting evidence that large law firms are successfully making the change, the case becomes clear: the sole-provider option is not only viable at most firms, including the largest, but it is actually becoming the norm. And, perhaps surprisingly, the vast majority of firms that have made the change are happier. While eliminating either Lexis or Westlaw is not appropriate for all firms, we believe that every firm must at least entertain the idea as part of regular due diligence and good business practices. Assessing sole-provider viability provides a firm an opportunity to review, revise and refine its legal information strategy and potentially save significant money. Unfortunately, even for firms wishing to remain dual-provider, the short-term kick-out of a vendor might be the only way to achieve reasonable pricing. It is hard to imagine a law firm emerging today choosing to purchase both Lexis and Westlaw, given unreasonably high pricing for redundant products. Similarly, there is no reason for your firm to feel imprisoned by the traditional dual-provider model. Implementing the change to sole-provider can be a challenging process, but the payoff can be tremendous. 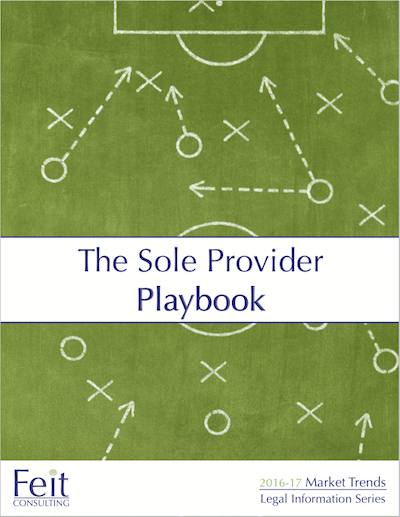 To learn more about what The Sole Provider Playbook has to offer, click here. 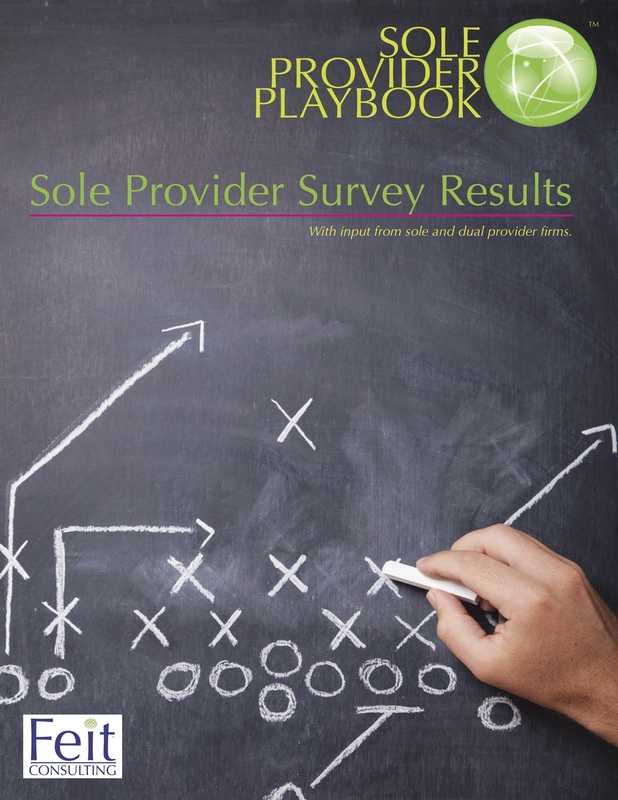 Below are positive comments and issues shared by sole provider firms who participated in Feit Consulting’s Sole Provider Survey. For the first time since the early 1990’s, retaining just Lexis or Westlaw has become the norm. Today, nearly 51% of large law firms have opted to retain only one vendor. There are roughly 400 law firms with over 100 attorneys in the US. Within the last year, Feit Consulting collected data on 389 of these firms. The majority, 51% (198), now only have one vendor. 75 large law firms have eliminated Westlaw, and 123 eliminated Lexis. As contracts are negotiated continuously, there is expected minor fluctuations in both directions. *Data Source: 2016 Feit Consulting Research. For the majority of firms that still pass through costs, the true cost is not what you are paying to Lexis or Westlaw. Instead, the true cost is what the firm was unable to pass through to clients. If a firm is forecasting future recovery rates >80% for either Westlaw or Lexis the business case will show that elimination is not worthwhile. The closer a firm is to passing through and recovering 80% of the costs, the opportunity for savings derived from the elimination of a vendor is essentially eradicated. 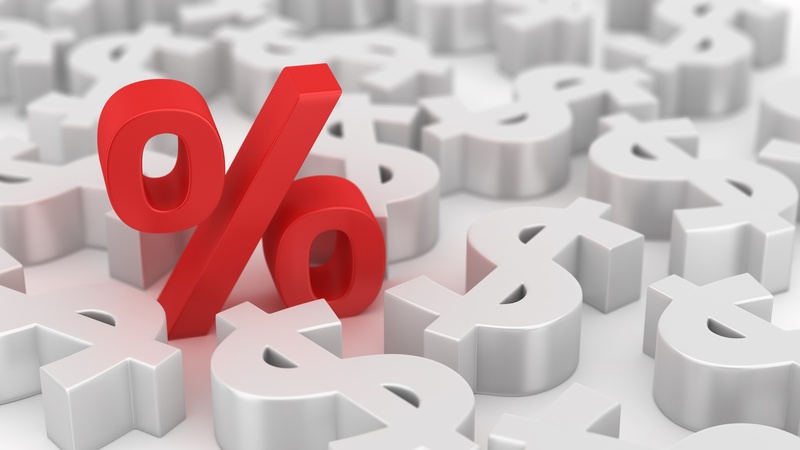 When recovery rates are high or the negotiated rates with Lexis and Westlaw are low, the costs to replace content and build workarounds, coupled with the hassles involved, would likely negate much of the benefit of going sole provider. Beyond knowing what is the firm’s true costs and recovery rates today, does the firm have a projection for the future? How do firms handle lost content? To purchase the full survey results, contact Feit.